Bowling Green, OH – Lafayette Blvd. Camden, OH – Lafayette St.
Clifton, OH – Lafayette Ave. Deer Park, OH – Lafayette Ave.
Elyria, OH – Lafayette St.
Greenfield, OH – Lafayette St. Independence, OH – Lafayette Blvd. Lodi, OH – Lafayette Rd. London, OH – Lafayette Rd. Maple Heights, OH – Lafayette Ave.
Marion, OH – Lafayette St.
Medina, OH – Lafayette Rd. Middletown, OH – Lafayette Ave.
Montpelier, OH – Lafayette St.
Niles, OH – Lafayette Ave.
Ravenna, OH – Lafayette Ave.
Saint Paris, OH – Lafayette Ave.
Seville, OH – Lafayette St.
Sheffield Lake, OH – Lafayette Blvd. Springfield, OH – Lafayette Ave.
Steubenville, OH – Lafayette Blvd. Toledo, OH – Lafayette St.
Urbana, OH – Lafayette Ave.
• May 8–9 – The steamboat Mechanic, conveying Lafayette to Louisville/Kentucky, sinks on Ohio. All passengers reach shore safely, but Lafayette loses property and money. The party is picked up the following day by the passing steamboat Paragon. Speeches were given, flowers were strewn in his path by school children, fireworks exploded (including one that spelled out Lafayette’s name and changed thirteen stars representing the original states into twenty-four), gala balls were thrown in rooms overflowing with patriotic ornamentation, and an impressive array of thousands of military men, many of them fellow veterans of the War of Independence, marched in parades to honor General Lafayette. 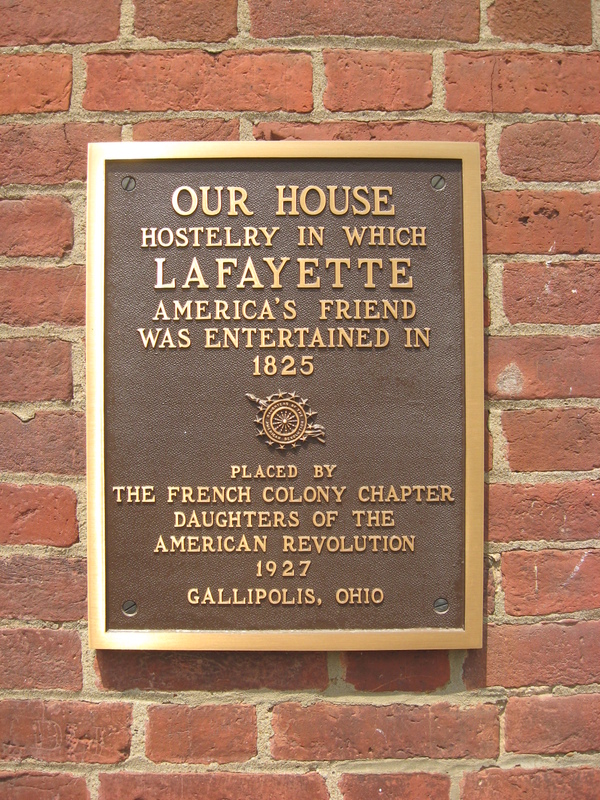 Gallipolis still celebrates Lafayette’s visit with a ceremony each spring. The Cushing family owned and operated Our House until 1865.